Daniel Kahikina Akaka (September 11, 1924 – April 6, 2018) was an American politician who was a United States Senator from Hawaii from 1990 to 2013. A member of the Democratic Party, Akaka is the first U.S. Senator of Native Hawaiian ancestry. He was the Senior Senator of Hawaii for a few weeks when Daniel Inouye died in December 2012. He studied at the University of Hawaii. In 1969, he was hired by the Department of Education as a chief program planner. In the 1970s he served in various governmental positions. 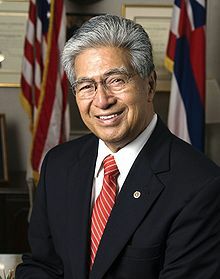 He was first elected to the United States House of Representatives in 1976 to represent Hawaii's Second Congressional District, and he served for 13 years. Akaka died in Honolulu of multiple organ failure on April 6, 2018 at the age of 93. ↑ 1.0 1.1 "Once a Soldier... Always a Soldier" (PDF). Legislative Agenda. Association of the United States Army. 2011. Archived from the original (PDF) on October 21, 2013. Retrieved January 26, 2013. Wikimedia Commons has media related to Daniel Akaka. This page was last changed on 6 April 2018, at 20:43.